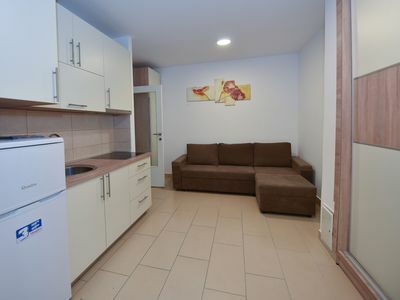 Type of studio apartment: SA Sedmica. 2 bed/s for adults. Number of extra beds 1. Capacity of the studio apartment (adults) (2+1). The category is 3 star/s. 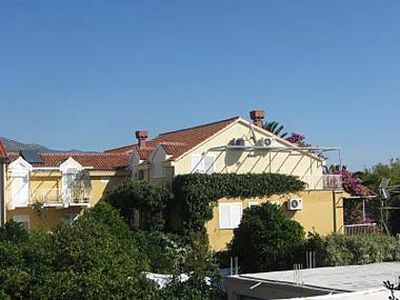 Size of the studio apartment is: 25 m2. The studio apartment is on the ground floor. Kitchen, living room and beds are in the same space. Flooring in the studio apartment: tiles. 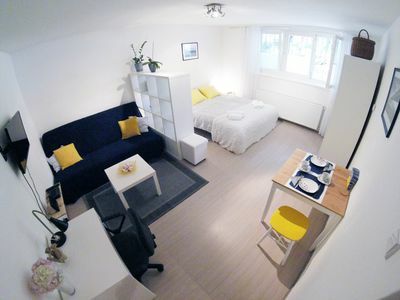 In the studio apartment is french bed. Extra bed/s in the studio apartment is/are: one couch/sofabed for one adult. Size of balcony in studio apartment is 6,10 m2. Features and equipment of the balcony/terrace seating set, covered, ground floor (garden terrace), orientation park side, garden view.